Many commercial buildings developed for the retail, hospitality, healthcare and multifamily industries use wood-framed design and construction techniques that use steep-sloped asphalt shingle roofs with enclosed attic or rafter spaces. 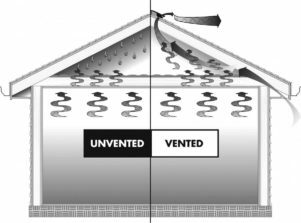 While current building codes use specific design criteria to reduce the likelihood of moisture problems in unvented attic systems, the most common and time-tested approach is to provide proper ventilation under the roof assembly. In the winter, moist, warm air from the lower portions of a building will tend to rise through the ceiling into the attic, especially through bypasses where electrical and plumbing fixtures are installed. In a cold attic, the warm, moist air condenses on the cold surfaces of the rafters, the nails and other metal, and the attic side of the deck. This excess water can create several problems. First, the condensation can cause the deck to swell, resulting in waviness and buckling of both the deck and the shingles. Second, the water can rot the roof deck, destroying its ability to carry loads and its nail-holding capability. Third, severe condensation can drip onto the insulation, reducing its effectiveness and possibly seeping through to the ceiling below. Damp insulation causes wood rot, mold, and mildew, leading to poor indoor air quality in the rest of the home. Another winter problem caused by poor ventilation is the formation of ice dams. Ice dams form in cooler climates during winter when heat collects in a poorly ventilated and/or inadequately insulated attic space. Built-up attic heat combines with the sun’s warmth to melt snow on the roof, even though outside temperatures may be below freezing. The flow of melting snow refreezes at the eaves and gutters. This freeze-thaw cycle can result in a pool of water that can back up under roof shingles and behind fascia boards, soak roof decking and wall sheathing, damage exterior and interior walls, peel paint and ruin ceilings. Current model building and energy codes include requirements aimed at reducing the chance of ice damming, which is more common in existing homes having less insulation that allows heat to escape through the attic and into the roof deck. For this reason, reroofing provides the perfect opportunity to reassess the roof and attic assembly and address any deficiencies while installing new roof coverings. Efficient ventilation requires a very specific type of air movement to provide year-round benefits. A flow of air must be established to produce air changes — a steady, high volume of air movement. System components must be correctly sized and positioned to provide constant air flow, moving in a constant direction, throughout the entire attic area. Air movement can be created using natural or mechanical ventilation. Two key forces create natural air movement: stack and wind effect. Mechanical ventilation relies on a power source. The stack effect occurs because air that is heated is lighter than cold air. This rising warm air causes the pressure in the upper parts of the attic to increase and lower parts to decrease. Air will naturally exit and enter at the higher and lower locations in the attic space, respectively, due to the pressure differentials. A well-designed ventilation system places exhaust vents at or near the ridge and places intake vents at the lowest point in the attic, typically in the soffit or near the roof’s edge. A properly designed ventilation system requires balance between the intake and exhaust vents to achieve the desired air flow capacity. In general, the net-free area of intake venting should be equal to or greater than the net-free area of exhaust venting. Net-free area is the total unobstructed area through which air can enter or exit a vent, measured in square inches. In addition, intake and exhaust vents must be positioned to create a proper high-low balance. Balance is achieved when half of the vent area is placed high in the attic (exhaust) and the other half placed low in the attic (intake). Without that balance, the area of effective ventilation is limited to the lesser of the two vent areas. Proper placement of exhaust/intake vents assures a continuous flow of air, moving in the desired direction. Intake and exhaust vents must be positioned to assure continuous airflow along the underside of the roof sheathing. Also, intake vents must be located so there is little possibility of rain or snow infiltration and that the intake opening isn’t blocked by dirt, building debris or attic insulation. The International Code Council (ICC), the U.S. Department of Housing and Urban Development (HUD) and ASHRAE have set standards for roof ventilation. Most shingle manufacturers have adopted these standards as minimum acceptable ventilation conditions in their shingle warranties. The standards require a minimum of 1 square foot of net-free ventilation area for every 150 square feet of attic floor space. However, if approximately half of the open ventilation area is in the upper portion of the roof, such as at the ridge, and half is in the lower area, such as at the soffits or eaves, the standard reduces to 1 square foot of net-free ventilation for every 300 square feet of attic floor space. A balanced system allows a less restricted, even flow of air throughout the attic space. Many states have adopted different versions of the ICC construction codes, including the International Building Code (IBC) and International Residential Code (IRC). Specific language addressing cross ventilation requirements in enclosed attic or rafter spaces is available in the 2012 IBC Section 1203.2 VENTILATION – Attic spaces. Overall, proper roof ventilation can play a critical role in preserving the life of the roof and building performance, especially in light of ever-changing weather conditions. With the above recommendations, durable, long-lasting roofs are well within reach. For more information about attic ventilation, visit the Asphalt Roofing Manufacturers Association (ARMA) website at www.asphaltroofing.org, or the Roof Assembly Ventilation Coalition (RAVC) atwww.ravcoalition.org.